5 Sylvia Hyman (Tennessee, 1917-2012) ceramic items. 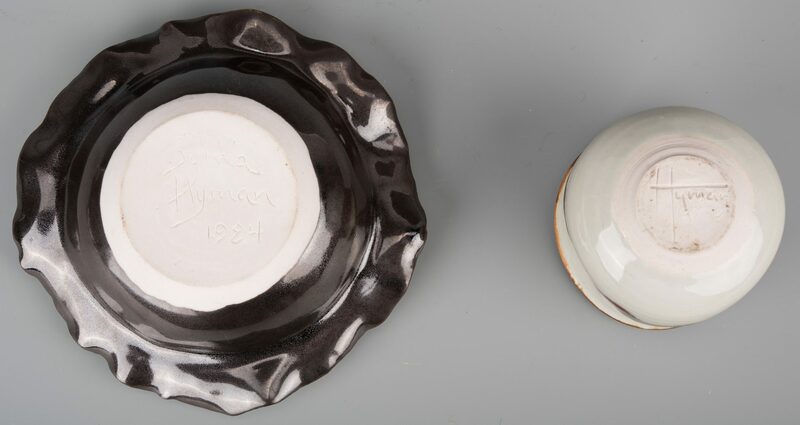 1st item: Flower frog with ruffled rim, incised on the base "Sylvia Hyman, 1984". 1 3/4" H x 7" dia. 2nd item: Geometric six-sided vase with pierced opening on top, incised on the base "Hyman, '63". 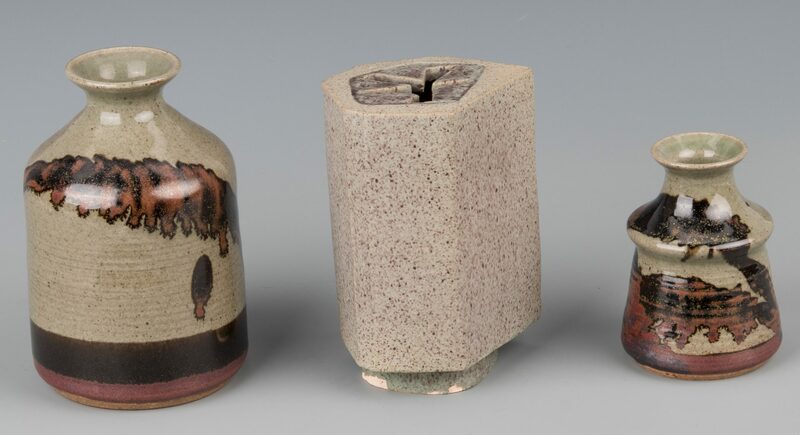 3rd item & 4th items: Pair of vases with flaring rims and 3-color glaze, both incised on the base "Hyman", 6 1/4" H and 4 1/4" H. 5th item: Small creamer with 3 pouring spouts and pinched body, incised on the base "Hyman", 3 1/4" H. Biography (courtesy Askart: The Artists' Bluebook): Sylvia Hyman was born in Buffalo, New York in 1917. She worked as a public school art teacher, as well as a faculty member of Peabody College. 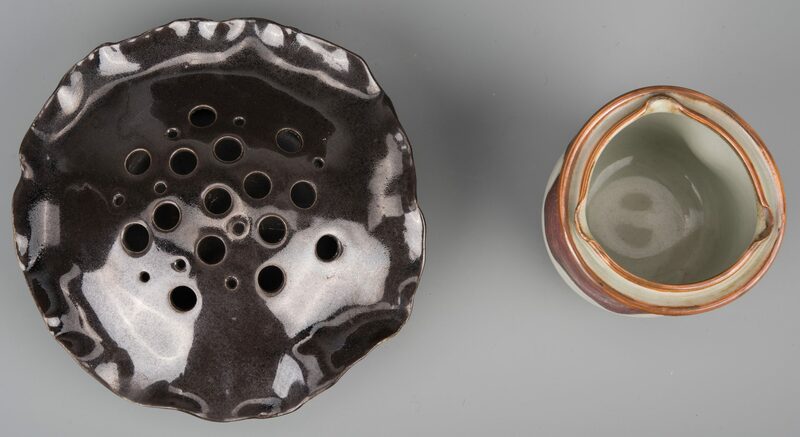 In 1957, Hyman received some ceramic equipment, which launched her artistic career as a ceramist. She became a specialist in creating trompe l'oeil ceramic sculptures. Examples of her work are the Smithsonian American Art Museum, the Museum of Decorative Arts in Prague, the Saga Prefectural Museum in Saga, Japan, the Tennessee State Museum in Nashville, and the Renwick Gallery in Washington D.C.; her work was also featured in the Art of Tennessee exhibit at the Frist Center for the Visual Arts in Nashville in 2003. Hyman received a Lifetime Achievement Award in the Craft Arts from the National Museum of Women in the Arts of Washington, D.C. in 1993 and the Tennessee Governor's Award for Lifetime Achievement in the Arts in 1994. A book of her artwork, The Intriguing Vision of Sylvia Hyman: Trompe l'Oeil Ceramic Artist, edited by Janet Mansfield, was published around the time of her death in 2012. Provenance: Collection of Charles and Ann Wells, Nashville, Tennessee. CONDITION: 1st item: Excellent condition. 2nd item: Some minor chipping to the base. 3rd-5th items: All excellent condition.